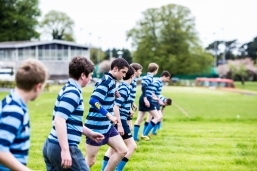 Rugby is the flagship sporting activity played at St Vincent’s Castleknock College and students of all ages and abilities are encouraged to participate in the game. The college is one of the oldest second level clubs in the country with a history dating back over 100 years and it holds eight Leinster Schools Senior Cup and eight Leinster Schools Junior Cup titles. Rugby is seen as vitally important to the development of the college students and its key values such as teamwork, leadership, determination, sportsmanship, and humility are actively encouraged. As well as providing physical education to your son it is an integral part of the social bonding process. It is viewed as part of the curriculum, not an add-on, and so is compulsory for 1st and 2nd year students. The first-class facilities allow each student to focus on achieving and performing to their full potential, whilst being guided by experienced and determined members of the coaching staff. St Vincent’s Castleknock College has appointed Adrian Flavin as its first full-time director of rugby and as a former professional player for 16 years he will add his experience and knowledge to the department.